for their content.I am sharing the details of some of the most popular Youtube channels of Pakistan.Here is the list of Top 10 youtube Channels in USA with details of Channels, Subscribers and Views. "World Wrestling Entertainment" WWE is famous United States wrestling Incorporation, which is ranked as the 1st most popular YouTube channel in the "United States" with an estimate of 25.46 million subscribers with 22 Billion Views and the total number of videos uploaded to this channel are 34,435. "Ryan ToysReview" is ranked as the second most popular YouTube channel in "United States"
with an estimate of 13.49 million subscribers with 21 Billion views and the total number of videos uploaded to this channel are 1,009. 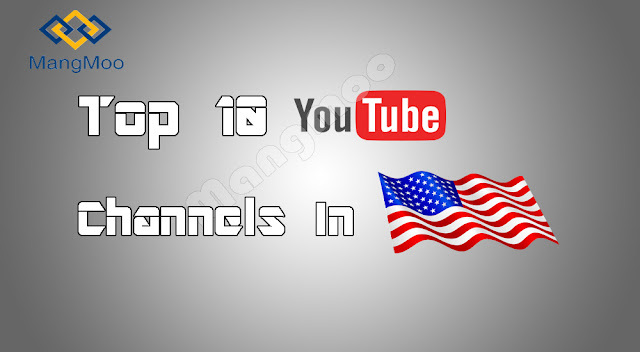 Movieclips is ranked as the 3rd most popular YouTube channel in "United States" with an estimate of 10 million subscribers with 12 billion views and the total number of videos uploaded to this channel are 29,694. "TheEllenShow" is ranked as the 4th most popular YouTube channel in "United States" with an estimate of 24 million subscribers with 12.03 billion views and the total number of videos uploaded to this channel are 8,633. "WORLDSTARHIPHOP" is ranked as the 5th most popular YouTube channel in "United States" with an estimate of 11.56 million subscribers with 8.19 billion views and the total number of videos uploaded to this channel are 3,919. "BuzzFeedVideo" is ranked as the 6th most popular YouTube channel in "United States" with an estimate of 15.61 million subscribers with 12 billion views and the total number of videos uploaded to this channel are 5,217. "ToyPudding Tv" is ranked as the 7th popular YouTube channel in "United States" with an estimate of 14.47 million subscribers with 10 billion views and the total number of videos uploaded to this channel are 2,015. "Family Fun Pack" is ranked as the 8th popular YouTube channel in "United States" with an estimate of 6.89 million subscribers with 7 billion views and the total number of videos uploaded to this channel are 1,037. "ABCKid TV - Nursery Rhymes is ranked as the 9th popular YouTube channel in "United States" with an estimate of 6.8 million subscribers with 4 billion views and the total number of videos uploaded to this channel are 336. "LuicFonsVEVO" is ranked as the 10th popular YouTube channel in "United States" with an estimate of 19.04 million subscribers with 8 billion views and the total number of videos uploaded to this channel are 52.